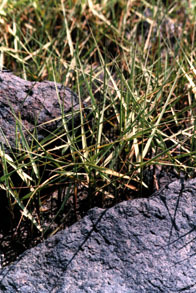 Growth Habit: An intertidal, estuarine saltmarsh grass which can grow up to 130cm in height. Its leaves are narrow, usually 45cm long and 1.5cm wide. Type of Plant: A perennial grass spreading by underground stems. Flowers: Up to six flowering spikes, each up to 20cm long, make up the flower head. Fruit/Seed: Dozens of seeds, measuring 1.5 to 2cm, are produced by each flower head. Dispersal: Seeds are spread by the wind and tide to establish new infestations. Existing plants also spread by underground stems. Distribution: Rice grass can be found on intertidal mud and sand flats in the Tamar, Derwent and Rubicon Rivers. Smaller infestations also exist at St Helens, Little Swanport and Stanley. The Tamar River has one of the worlds largest infestations of rice grass. Rice Grass accretes massive quantities of silt and debris along the edges of estuaries. This silt and debris may totally exclude all native flora and fauna. It also destroys amenity values such as sandy beaches. Grubbing. Hand pull single plants. Slashing. For small areas the rice grass can be slashed to 10cm in height and then smothered with black weed matting. The matting must be secured to the mud, to prevent it being washed away. Grazing or burning. Stock can be used however this may degrade the mudflats. Herbicides. This technique can be used on large infestations. As rice grass grows on the mudflats, chemicals can only be used under strict control. For more information contact DPIWE or Rice Grass Advisory Board.